Did you know that about 90 percent of all health issues can be traced back to the gut? Making dietary changes and addressing my gut health was the most transformative step I took on the road to my own Hashimoto’s remission. I had been experiencing bloating, stomach pains, irritable bowel syndrome, and acid reflux for quite some time — in addition to fatigue, hair loss, brain fog, and anxiety. I didn’t immediately connect the dots that all of these varied symptoms were related to the health of my gut. But when I did, I realized that I had found an important clue that led me down the path toward healing my own thyroid condition. Our guts are home to several trillion probiotic bacteria, collectively referred to as our gut microbiome. Our gut bacteria synthesize vitamins, help us absorb nutrients, control our immune systems, and even produce neuroactive compounds that impact mental health! Diet is the single biggest influence on microbiome composition. In fact, diet is directly responsible for more than 60 percent of the variation in bacterial species in the gut. The other 40 percent comes from lifestyle, medications, and environmental exposures. Our gut barrier is the largest barrier between our bodies and the outside world. It has the important job of letting nutrients into the body while keeping bacteria, viruses, parasites, and toxins out. When the integrity of the gut barrier is impaired, these harmful organisms and substances can leak into the body, hence the term leaky gut. And, as the connection between intestinal barrier function and health gains more recognition, the role that diet and lifestyle play in gut barrier health is also being examined more intensively. The idea that all cases of autoimmunity involve some degree of intestinal permeability (or “leaky gut”) has become widely acknowledged by functional medicine practitioners. A leaky gut has gaps in the gut lining that allow irritating molecules and substances to escape from the digestive system, and enter into the bloodstream. This irritation can interrupt the immune system’s ability to regulate itself and put the body into a perpetual “attack mode” that is counterproductive to healing. Researchers have theorized that for autoimmunity to occur, three factors must be in place: a genetic predisposition, a triggering event, and intestinal permeability. Most people with Hashimoto’s do have some degree of intestinal permeability. 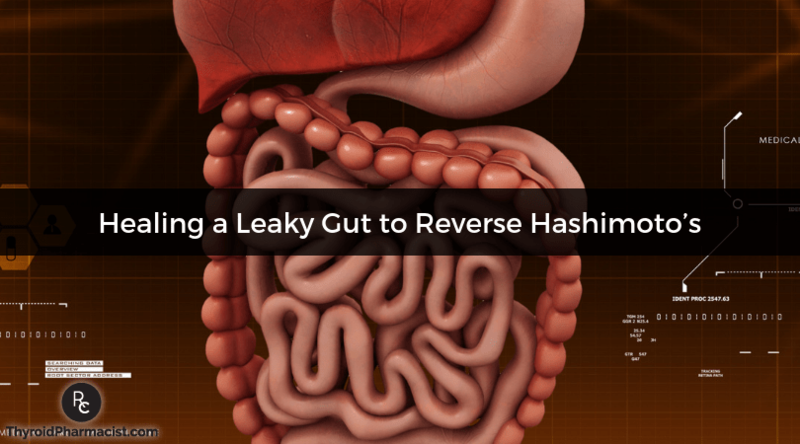 Even those who have no apparent gastrointestinal symptoms may have a leaky gut, and addressing gut function might be the best place to start to bring healing to the body. If we can reverse leaky gut, we can prevent or reverse autoimmunity altogether. Stress: When you experience a stressful event (physical or mental), your adrenal glands release a flood of stress hormones, including cortisol. With chronic stress, these hormones cause inflammation and damage to the immune system — 80 percent of which resides in the gut! Food sensitivities: Reactive foods trigger an inflammatory response in the GI tract, and can damage the intestinal lining whenever they are eaten. Gluten, dairy, and soy are common reactive foods in Hashimoto’s, though any food can become problematic. Nutrient deficiencies: Deficiencies in several key nutrients have been implicated in increased intestinal permeability. This is because they help protect the stomach lining from damage due to infections, reactive foods, pathogens, and medications. Deficiencies in digestive enzymes: Deficiencies in stomach acid and digestive enzymes, which are common in those with Hashimoto’s, can prevent the digestive tract from properly breaking down food. This allows undigested particles to travel through the intestines and damage the gut. An imbalance of gut bacteria: When the beneficial bacteria residing in the gut become outnumbered by harmful bacteria, those pathogenic bacteria can damage the gut wall. Intestinal infections: Infections such as Blastocystis hominis, H. pylori, SIBO, and yeast overgrowths can bore into the intestinal lining and create perforations. Eliminate reactive foods – Removing reactive foods like gluten, dairy, and soy, as well as identifying and removing any unique food sensitivities, will help to reduce the immune response and allow the gut to begin healing. Address nutrient deficiencies – Adding nutrients like vitamin A, vitamin D, and zinc, which support gut and immune health and are often depleted in those with Hashimoto’s, can help prevent further damage to the intestinal lining. Replenish enzymes – Supplementing with betaine with pepsin to support stomach acid and protein digestion, as well as combinations of fat and carbohydrate digestive enzymes, supports the digestive process to ensure that food is adequately broken down. Replenish beneficial bacteria – Incorporating a probiotic supplement and adding fermented foods into the diet helps to restore the gut microbiome and decrease damage caused by pathogenic bacteria. These key steps can be life-changing for most people with Hashimoto’s. Additionally, managing stress through lifestyle interventions can go a long way to combating chronic stress. Meditation, yoga, journaling, and simplifying your life by saying “no” more often, are just a few ways to help reduce stress levels and relieve some of the burden on the immune and digestive systems. With so many dietary and lifestyle changes out there to help heal your gut, you may be wondering, so where do I begin? My friend and colleague, Dr. Sarah Ballantyne, PhD, has put together a great 6-week online course, called the Leaky Gut Mini-Course, to help get you started. This self-directed, video-based course will teach you about the various aspects of a healthy gut, how diet and lifestyle affect gut health, and what to do to heal a leaky gut. This great resource gives you a foundation for understanding your gut health and helps to hone in on what you can do today to improve yours! Even better, Dr. Ballantyne has provided me with this exclusive coupon code, just for my readers! Use the code ThyroidPharm19 to get 25% off the Leaky Gut Mini-Course, PLUS a FREE copy of Dr. Ballantyne’s eBook, Fantastic Fiber! Hurry, because this amazing offer will expire on March 30th. You can get instant access to this life-changing course here! I hope this information and resource will help you on your journey to better gut health and wellness! Bischoff SC, Barbara G, Buurman W, Ockhuizen T, Schulzke JD, Serino M, et al. Intestinal permeability – a new target for disease prevention and therapy. BMC Gastroenterol. 2014;14:189. doi: 10.1186/s12876-014-0189-7. Lima AA, Soares AM, Lima NL, Mota RM, Maciel BL, Kvalsund MP, et al. Effects of vitamin A supplementation on intestinal barrier function, growth, total parasitic, and specific Giardia spp infections in Brazilian children: a prospective randomized, double-blind, placebo-controlled trial. J Pediatr Gastroenterol Nutr. 2010 Mar;50(3):309-15. doi: 10.1097/MPG.0b013e3181a96489.